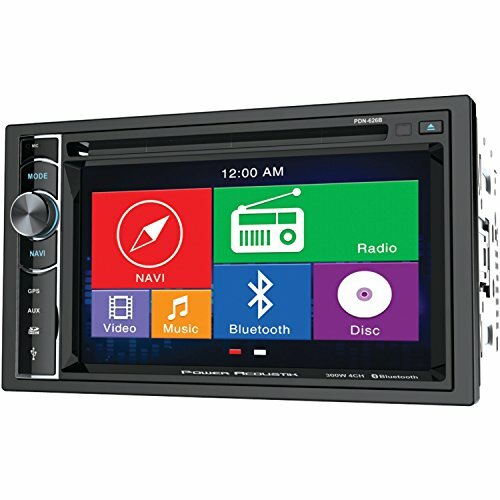 The PDN‐626B 6.2" double-din in-dash GPS navigation LCD touchscreen DVD receiver with Bluetooth from Power Acoustik is a media player can handle DVD, CD or 64GB SD card/USB flash drive and supports MP3 and WAV audio files and MP4 video files as well. It has turn-by-turn GPS navigation of USA, Canada and Mexico. And a database of 12-million POIs! you can also safely make and receive hands-free phone calls, scroll contact lists and stream audio with Bluetooth from your enabled smartphone. The unit has a 6.2" LCD touchscreen with 800 x 480 widescreen resolution with 400 nits LED backlight. The unit has 75-watt x 4 MOSFET speaker outputs, multiregional FM Frequency stepping, front and rear preamp audio outputs, variable subwoofer preamp Output, video Output for aux devices and rearview camera Input with trigger. It also accepts a Fahrenheit OEM and steering wheel control interface and includes Built-in microphone & external microphone.